We welcome you to join us for a delicious, home cooked Shabbat dinner and lunch in a unique and intimate setting. For a memorable experience be sure to make your reservation today! Friday night Services and dinner takes place at The Jewish Center. Please contact us location and time. Shabbos day Meal and kidush takes place at our home. Our home is open to all, and we do not charge our guests. However, we encourage you to contribute towards our activities; your generous help will enable us to keep our home open and assist many more visitors in the future. UNH & Seacoast Chabad Jewish Center is not funded by Chabad Headquarters in New York. We, as every Chabad Center, are responsible for all funds of our operating budget. We are supported exclusively by the generous contributions of individuals who care about our community. 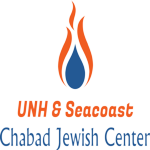 All funds raised by UNH & Seacoast Chabad Jewish Center remain in our center and go directly to benefit the students and community of UNH & the Seacoast with Jewish programming and services.